There were a total of 7 sections with all riders required to ride two rounds. All the riders were to finish the same section before moving on to the next section together. The reason for this format was primarily due to the lack of qualified Observers to man all the sections at once. From my point of view, it was great, as I could take photos and videos of the riders in sequence (ran out of disk space... LOL.). Crowd-wise, it was fantastic... spectators and riders gathered together to watch the riders take on the sections making it so exciting for everyone. From the competitor's point of view, it was not so great. Riders lost momentum as they needed to wait for the other riders to finish first before moving on to the next section. Their competitiveness, pace and drive were mellowed and a bit too chilled... LOL. 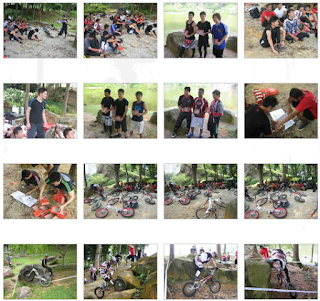 Thus, it was not surprising that by about 3:00pm, the riders could only managed to reach Section 7. And so, due to a unanimous decision, the competition was concluded with only 1 round instead of 2. However, the Open category riders went for Round 2 as there were only 4 competitors in that category, and they were able to complete the round in less than 30 minutes. Out of the seven sections, only two were not setup on a slope. The rest were all setup and laid out at the slopes along the lake. In my opinion, I think Section 5 was the toughest, especially the Elite's route. Upon entry, you will need to ride (or rather hop) up a steep slope. Then you will need to side hop a 5 foot high rock. Because of the slope, even "dapping" onto the rock was extremely difficult. Not surprisingly, none of the Elite riders could finish the section.